WASHINGTON March 11, 2016 — Homeland defense is the first priority of U.S. Northern Command, Navy Adm. William E. Gortney told members of the House Armed Services Committee yesterday. Gortney wears two hats as commander of Northcom and of North American Aerospace Defense Command, both headquartered in Colorado Springs, Colorado. The admiral testified before the panel on how the fiscal year 2017 DoD budget request impacts Northcom and NORAD. He also discussed command operations. Within cybersecurity, he added, Northcom’s responsibility is to defend its own networks. Gortney named the Islamic State of Iraq and the Levant and whatever form it takes in the future, and transnational organized criminals who move drugs, people, weapons and anything else that will turn a profit as the most dangerous and likely threats to the nation. Terrorist organizations and global criminal networks exploit what the admiral calls “seams” between nations in North, Central and South America; seams between the government agencies of those nations; and seams created by inadequate authorities, resources and training of many of the same agencies. Today's evolving and resurgent threats are a function of the return to great power competition and the continuing threat of global terrorism, Gortney said. These threats, he said, create vulnerabilities best mitigated through an integrated and binational approach across multiple domains that requires an integrated defense in the air, in space, on and under the sea and on land domains. The commands work seamlessly together to defend the homeland in the air through NORAD and the remaining domains through Northcom, facing the traditional and nontraditional threats in our assigned battle space, Gortney said. NORAD and Northcom are focused on unity of command and effort, he said, two commands but a single integrated headquarters, organized and trained to face the diverse array of evolving national security threats. Traditional military threats now exist created by the return of great power competition as illustrated by the recent actions of Russia, China, North Korea and Iran, Gortney said. Regarding nontraditional threats, the admiral said his main concerns involve homegrown violent extremists who are self-radicalized and don’t actively communicate with ISIL. “To counter this threat I'm a support team commander to the Department of Homeland Security, the Department of Justice and the many law enforcement agencies engaged in this crucial fight,” Gortney explained. Homeland partnerships also enable Northcom-NORAD success, he said. Northcom partners continuously with the interagency, the admiral said. Partners include National Guard airmen and soldiers, the intelligence community, law enforcement agencies and the Department of Homeland Security, which is Northcom’s closest partner, he said. “Our mission partners maintain nearly 60 liaison officers in our headquarters and these patriots are fully embedded in … our intel organization,” Gortney said, noting that building partnership capacity is vital to Northcom’s mission. At Northcom, he added, 70 percent of major exercises -- involving nearly 200 each year -- are focused on mission partners as the primary target audience. Note: In the above Air Force photo taken by T.C. Perkins Jr., airmen from the 6th Air Refueling Squadron at Travis Air Force Base, Calif., fly a KC-10 Extender mission to support aerial refuel operations for fighter aircraft conducting patrols of the airspace surrounding Super Bowl 50 in Santa Clara, Calif., Feb. 7, 2016. 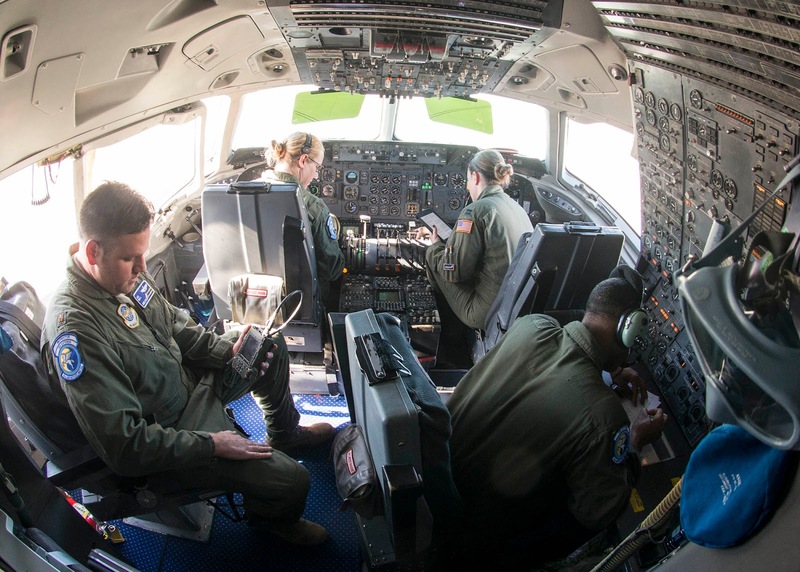 The refueling operation was part of a North American Aerospace Defense Command mission in conjunction with NORAD’s air component Continental North American Aerospace Defense Command Region. NORAD ensures United States and Canadian air sovereignty through a network of alert fighter, tankers, airborne early warning aircraft, and ground based air defense assets cued by interagency and defense surveillance radars.